Revealed in chapter 67, the real Glen Baskerville who was later replaced by Oswald, his servant (and Lacie´s brother) who took the same name. He met Jack at his mansion when Jack found Lacie after 8 years. Amused by Jack´s character, he gave him a map to the mansion and permission to visit Lacie. He also had Oswald investigate his past. 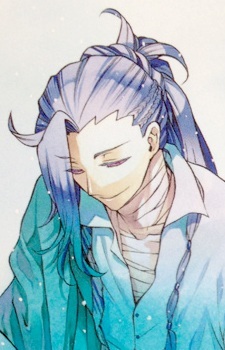 He is the father of both Alice's and wanted one to merge with the core so the Baskervilles would be able to use it's power, however since he was soon going to become Humpty Dumpty he gave the task to Jack of watching his experiment and using the Will of the Abyss to grant his wish. He correct Alice's spelling of Oz's name as she had spelled it Os in commemoration of Oswald. Later after his body finally expired and became the chain Humpty Dumpty he would make a contract with Celia Baskerville to protect the current Glen's (Oswald) soul.